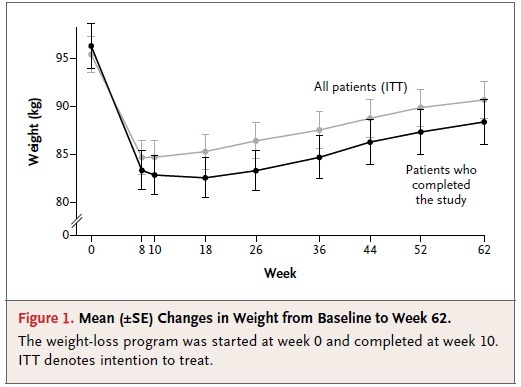 A new study published in the NEJM enrolled 50 overweight or obese patients (BMIs between 27 and 40) in a 10-week 500 calorie diet of Optifast VLCD and low starch vegetables. As might be expected with such a rigorous diet 16 dropped out or did not lose the expected weight (indicating they might not have been abiding by the diet) and were excluded. The successful dieters dropped an average of 29 pounds from their original average weight of 209 pounds. After the 10 week diets, subjects were given dietary advice to maintain their weight loss, followed up on in person every 2 months, and given phone calls in between with dietary counseling. Despite this, participants on average gained back 12.1 pounds they lost. What makes this study cool is that they looked at hormone implicated in appetites before, immediately afterwards, and a year after the diet, and analyzed them beside the patients’ subjective desires to eat. Hormones measured included leptin, famous for the knockout mice that do not express leptin (or alternatively the leptin receptor) and become obese, and ghrelin, a peptide that signals hunger, which rises before meals and then decreases following them. 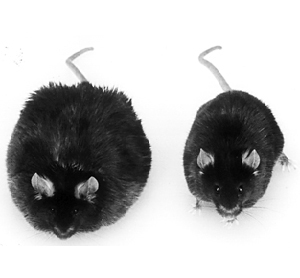 Obese Lepting Knockout Mouse left of normal wildtype mouse. They measured each hormone following a night of fasting and then at various time points for four hours after a meal. They also measured hormones such as insulin, glucagon, ghrelin, peptide YY, amylin, cholecystokinin, and gastric inhibitory polypeptide, and blood levels of glucose, non-esterified fatty acids, and insulin resistance. Hormone levels changed to increase appetite after the diet-induced weight loss and did not revert back to their original levels a year after the study. This helps explain biologically what many already know—that it’s hard to stick with a diet. It’s not all bad news though, knowing is half the battle. Dieters need to know that following the extreme weight loss, their appetite will not lower in just a year. Research has shown in animal models of diet-induced obesity that multi-hormone therapy can help in weight loss and maintenance. Perhaps hormone therapy could help with weight loss like a nicotine patch. It would be interesting to see a similar study with exercise-based weight maintenance to see what happens to hormone levels and appetite then. If you want to learn more about Hormones check out my other posts.